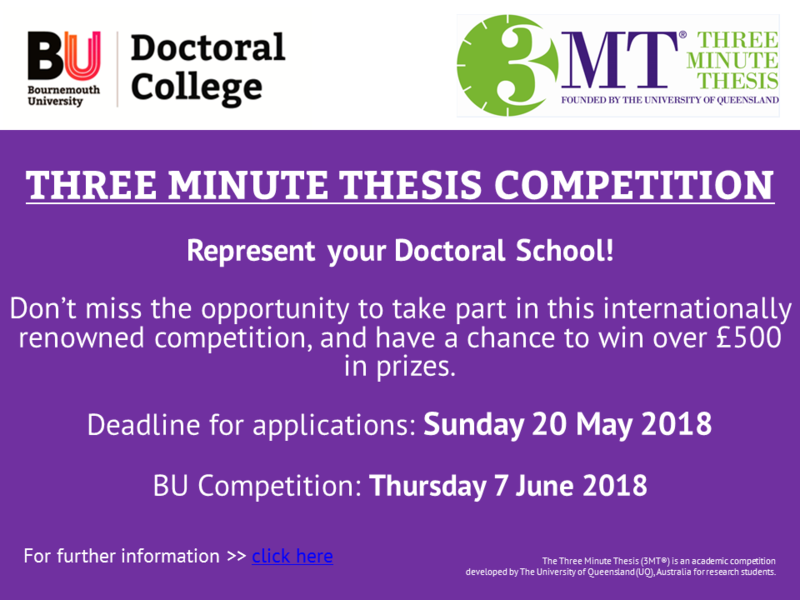 Booking for the Three Minute Thesis Competition is now open. This event will challenge PhD students to share their research in one static PowerPoint slide in 3 minutes. Come along to support them. This event will be followed by a networking opportunity. Presentation list and times to come. Do you want to share your research? All the hard work shouldn’t go unheard! 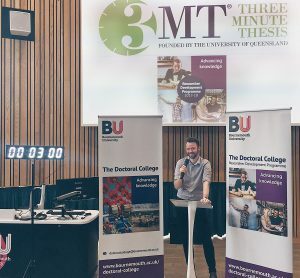 Only a few more days left to get your application in for the inaugural Three Minute Thesis (3MT) competition ⏱. Find out more information about eligibility, prizes and how to apply on the Doctoral College Research Development Hub. For any queries please email Natalie or Clare at PGRskillsdevelopment@bournemouth.ac.uk. Looking for a different way to disseminate your PhD research? Do you want to showcase your PhD? Raise the profile of your research? Be in with the chance of winning over £500 worth in prizes? If the answer is yes to any of the above then the 3MT® might be the opportunity for you. The 3MT® competition cultivates students’ academic, presentation, and research communication skills. 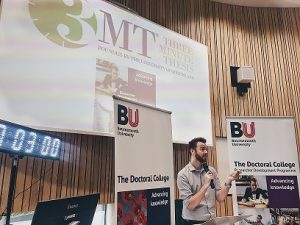 Presenting in a 3MT® competition increases capacity to effectively explain research in three minutes, in a language appropriate to a non-specialist audience. Eligibility: Active PhD and Professional Doctorate candidates who have successfully passed their transfer milestone (including candidates whose thesis is under submission) by the date of their first presentation are eligible to participate. If your Viva Voce will take place before the date of the University final (7 June 2018) you are not eligible to enter the competition. Eligible applicants should submit a fully completed application form, to the Research Skills and Development Officers at PGRskillsdevelopment@bournemouth.ac.uk by midnight on Monday 5 February 2018. What does ‘public engagement’ mean? What can researchers gain from encouraging people outside of academia to read their work? And where should you begin? We hear from Lucy Robinson, Citizen Science Manager at The Natural History Museum, as well as PhD students explaining their thesis in three minutes as part of the Three Minute Thesis competition. PGRs hurry! Get your 3MT application in. The Countdown Begins – Can you beat the clock? 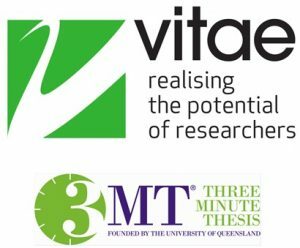 Deadline for the Doctoral College 3MT application submission is Sunday 22 October 2017. For more information, eligibility and how to apply visit the website. Don’t miss out on the chance to win £400 towards a conference of your choice, plus entry into the Vitae National 3MT competition plus £100 voucher.